Cake Decorating Airbrush Kit - 12 Color Set. Perfect for all levels from novice to professional. Contains everything you need to start airbrushing the day it arrives. Includes a premium, single-action, external-mix airbrush and two professional dual-action internal-mix airbrushes. The airbrushes' solvent-resistant needle packings are safe to use with all airbrush mediums, including food application and body art. Set comes with twelve bottles of high-pigment Chefmaster Air Brush Food Coloring. USA-made, 100% gluten-free, Certified Kosher colors are highly concentrated to provide superior coverage on hard-to-color, non-dairy whipped toppings, butter cream icings and other decorative edibles. Included professional-grade airbrush compressor quietly delivers consistent air pressure for even results. 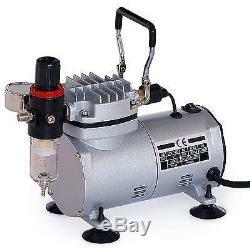 Airbrushes connect to the compressor with an included 10 foot braided air hose. The oil-free compressor design makes this set-up perfect for nail art, food decorating, body art and all other standard airbrushing applications. A table-top airbrush holder lets you place four airbrushes right on your table during sessions to make the most of your workspace. 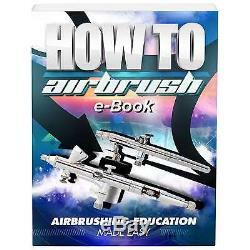 Includes instructions and seven exclusive how-to airbrush cake guides to improve your skills. 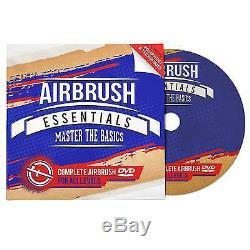 Comes with Airbrush Essentials: Master The Basics DVD, which will walk you through getting started or mastering basic skills. 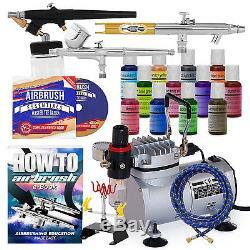 Premium broad-spray single-action, external-mix, siphon-feed airbrush (Airbrush #1). External-mix design means less clogging, even when spraying highly viscous materials. Easily adjusted by twisting the pre-installed, 0.8mm nozzle to increase or decrease the material flow. Especially suited for large areas or broad spray patterns between 1/4" and 3". Boxed set includes two 22cc glass bottles (one siphon-feed cover and one closed cover), a paint pipette and instruction sheet. Airbrush uses M5 air hose fittings. Includes an adapter so airbrush can also be used with 1/8 BSP air sources. Premium dual-action, internal-mix, gravity-feed airbrush (Airbrush #2). Precision-crafted body provides a balanced feel in the hand. Tight-tolerance head provides extremely fine atomization with razor-sharp detail. Initial-flow control screw can be adjusted to hold trigger partially back, so material begins to flow at the pre-set rate as soon as the trigger is depressed. Pre-installed 0.35mm nozzle (tip), nozzle cap, needle, and removable needle cap for a spray pattern between thin-line and 1.5. Fine-finish, stainless-steel needle minimizes tip-dry. Uses siphon-feed 22cc glass bottle and 5cc bottom-feed color cup. Solvent-resistant needle packing allows safe use with all types of spraying mediums. Cutaway handle for ease of cleaning and quick access to the needle chuck. Airbrush uses standard 1/8 BSP air hose fittings. Premium dual-action, internal-mix, gravity-feed airbrush (Airbrush #3). Pre-installed 0.3mm nozzle (tip), nozzle cap, needle, and removable needle cap for a spray pattern between hairline and 1.25. Needle backstop at the rear of the airbrush allows you to pre-set the trigger travel, helping produce consistent line widths. Airbrush uses gravity-feed 7cc color cup with vented, anti-spill cover. Delivers excellent power (1/5 horsepower, 1.0 CFM) with ultra-quiet operation (55 db). Works on demand, running until it reaches approximately 58 psi, then cycling off until pressure reaches 40 psi before restarting. Auto-start/stop feature saves power and reduces motor wear & heat while maintaining enough pressure to operate most airbrushes. Compact and lightweight (8 pounds) with easy-carry handle. Rubber feet to protect your work surface. Oil-less design makes this compressor suitable for food decorating, body/nail art and all other standard airbrushing applications. Maintenance-free, CE certified and thermally-protected. Uses standard 1/8 BSP male outlet. Uses 6 foot US-standard 120 volt power cord. Dimensions: 10" long, 4" wide, 7 tall. High-pigment Chefmaster Air Brush Food Coloring. Premium Chefmaster airbrush food coloring. Ideal for food decoration and cake design. Superior coverage, even on hard-to-color, non-dairy whipped toppings and icings. Prevents water spots and icing breakdown by eliminating the need to over-apply. Non-toxic, highly concentrated color is produced in a facility with no tree nuts or peanuts. Made in USA, 100% gluten-free, and Certified Kosher. The following colors are included. Harvest Brown, Deep Pink, Sunset Orange, Midnight Black, Super Red, Spring Green, Canary Yellow, Hawaiian Blue, Violet, Royal Blue, Neon Green and Neon Pink. 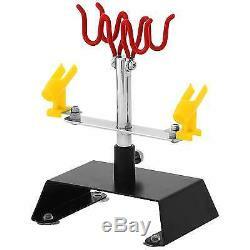 Tabletop airbrush stand with heavy-duty steel base. Holds up to four airbrushes simultaneously. Two tilting, coated airbrush cradles. Swivel-base assembly can be held in place with tension knob. Attaches securely to any smooth surface with suction-cup feet. Remove feet to permanently secure the stand to any flat surface (screws/bolts not included). Includes a download link for the following seven educational guides. Top 8 Cake Airbrushing Tips. Guide to Airbrush Cake Decorating. Airbrush Essentials: Master The Basics DVD. Perfect beginner's airbrush guide. Walks aspiring airbrush artists through many of the steps involved in learning the art. Topics include: Set-up of the air compressor, Cleaning and maintenance of the airbrush, Basics of paint type, and Operation of the airbrush. Run time is 38 minutes. 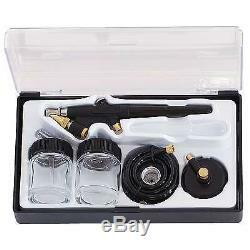 1 premium single-action siphon feed airbrush with pre-installed 0.8mm nozzle set (Airbrush #1). 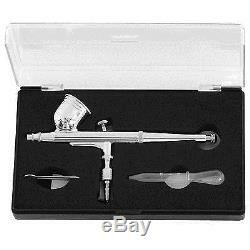 1 premium dual-action gravity feed airbrush with pre-installed 0.35mm nozzle set (Airbrush #2). 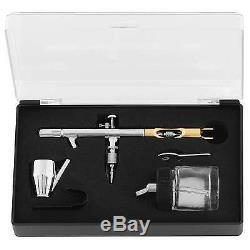 1 premium dual-action gravity feed airbrush with pre-installed 0.3mm nozzle set (Airbrush #3). 1 ultra compact, oil-free air compressor. 12 bottles of Chefmaster Air Brush Food Coloring. 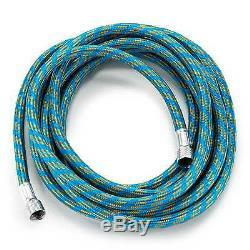 1 ten foot braided air hose. 1 five foot air hose with M5 propellant can fittings. 1 M5 propellant can air source regulator. 7 exclusive how-to airbrush cake guide downloads. 1 Airbrush Essentials: Master The Basics airbrush DVD. The item "Cake Decorating Airbrush Kit 12 Color Set" is in sale since Thursday, May 12, 2016. This item is in the category "Crafts\Art Supplies\Painting Supplies\Airbrushing Supplies\Systems & Sets". The seller is "professionalemporium" and is located in Fort Lauderdale, FL. This item can be shipped to United States, Canada.